Integrity, Quality, and Craftsmanship is what this company is built on. To preserve the lost art and quality of architectural sheet metal work. Every job we do, we strive for historic quality. We believe it is important for the customer and those who will follow to see that no shortcuts were taken and pride was in the workmanship. Hopefully that will encourage continued pride in workmanship in future generations. 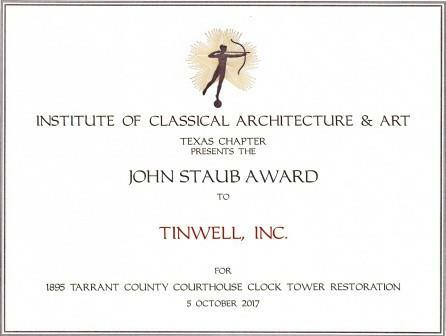 Tinwell is an Architectural Sheet Metal Company. It was founded and incorporated in 2003. We service the Dallas/Fort Worth area working on residential and commercial projects. We design, fabricate, install, or supply architectural sheet metal products to our customers. Our specialty is architectural sheet metal historic restoration. Our most recognized historic project is the 1895 Tarrant County Court House. See our gallery for more information on this project. The owner and founder of Tinwell Sheet Metal is John M. Howard Sr. His architectural sheet metal working experience dates back to 1979 and his family history in metal working (blacksmiths) dates back to 1862.